Mary Charleson is a marketing speaker, educator, writer and consultant. She presents keynotes & workshops at conferences and any type of business or organization. Charleson believes that it comes to marketing, it all starts with a solid strategy. Mission, vision, objectives, and strategies must all align with core offerings, core competencies, and a segmented approach to create a unique positioning. Mary Charleson’s expertise helps any organization launch, expand, or refocus. Mary Charleson develops strategies for strategic business units, markets, products, pricing, distribution, and promotions. Our recommendations are based on an assessment of your internal strengths and weaknesses, external threats and opportunities, your competition, the customer and the business environment, as well as segment opportunities and trends analysis. As a member of the Canadian Association of Professional Speakers, Mary Chareleson’s customized presentations marketing presentations appeal to a variety of different clients. She has the ability to use storytelling and her research into large and small businesses best practices, address audiences in a compelling and memorable way. Mary Charleson can also build a half or whole day workshop to make the program specifically for your business. Mary Charleson is a sought after academic, who actively consults in her field, bringing current knowledge and examples to every audience and presentation. Mary regularly delivers marketing seminars for Small Business BC, as a way to support the entrepreneurial community in Western Canada. This session will introduce the concept of thinking like a media mogul by using owned, rented, earned, embedded and paid media for content marketing. It will focus on the use of your owned media – the stuff you control and produce content for such as e-newsletters and blogs, and explore the use of rented media – broadcast and social media that you decorate as your own, use to engage, but are ultimately a space where the landlord controls the rules. This presentation explores in detail the use of platforms such as Facebook, Twitter, Instagram and LinkedIn as tools for broadcast and engagement in this capacity. You will also learned about earned media – how to get free publicity, and embedded media – how to become a published or broadcast authority using the reach of an established media player like the Huffington Post, CBC or the Globe and Mail. And finally, we round out you strategy with practical ideas on utilizing paid media to further leverage your marketing. You will learn the top 3 reasons why content marketing is critical these days and how to best approach it with a solid strategy. Learn to punch far above your weight and budget using content marketing, and leveraging all media platforms. * Learn how to approach social media with a strategy that achieves your goals and doesn’t waste time. * Learn how to leverage word of mouth and storytelling in your media efforts. * Gain insights to maximize your free publicity. * Learn how to use various media and marketing efforts to create community with your customers. Mary inspires business leaders to understand trends and generate new ideas to make marketing more effective. Pithy, often irreverent, but never short on actionable insights, information is presented in a compelling and memorable way; through storytelling, research, and in short 5-minute segments on a variety of marketing topics. After gaining insights on the challenges that a business or industry is facing, Mary selects a series of 5-Minute Marketing insights to meet the client’s specific needs, while considering current market trends and opportunities. Tired of other speakers loosing your audience after the first 5 minutes? The unique 5-Minute segment structure of Mary’s approach keeps even the most attention deficit challenged audiences alert and ready to put insight into action! Constantly updated with insights from Mary Chareleson's marketing presentations can stand alone as a keynote, or be modified for a breakout session or workshop. For smaller groups Mary uses a gamification approach, allowing participants to select the material and order that it is presented in a fun and memorable way. * Social media mistakes: Lessons from top global brands. 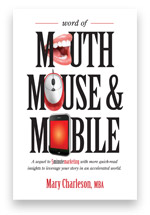 * Word of mouth mouse & mobile: Leveraging your stories for success. * Social media: Going viral for all the right reasons. * Branding: Make a name for yourself before someone else does. * Going mobile: What you need to know about the future. * Disruption: Learn to love it. * The path to purchase: adapting to change. * Creative wall of fame & wall of shame: Learning from winners & losers. * Bought, earned and owned: Leveraging your media. Get the marketing knowledge you need first and fast! Mary Charleson makes a complex subject simple and does it in over sixty short articles for the time-starved reader. Utilizing Canadian research and business examples, she gives readers the marketing tools to succeed. Pithy, often irreverent, but never short on actionable detail, this is the marketing book you’ll wish you had discovered long ago. For entrepreneurs, business owners, marketing managers and students. This second book is a sequel to Five-Minute Marketing with more quick-read insights to leverage your story in an accelerated world. A powerful story leverage through word of mouth, mouse and mobile, is the secret to connecting with customers in our time-starved and media fragmented society. Whether you’re just starting out or a seasoned veteran, these easy-to-read and apply five-minute articles will enhance your efforts.